“Let me be clear: HHS could have transferred every child out of our care to a parent who is currently in DHS custody today if we did not take into account child safety or whether the adult is actually the parent,” HHS Chief of Staff Chris Meekins, told reporters. Meekins went on to explain that three “parents” admitted they were not actually related to the children with whom they were ordered to be “reunited” when agents brought out DNA swabs to test parentage. Two others were proven to not be the parents when DNA tests were completed. Eight other purported parents will not be “reunited” with children due to failed criminal background checks that turned up serious convictions or child abuse. “Our due diligence is protecting children,” Meekins said. According to the court filing, four children have already been reunited with parents. These parents have, according to DHS officials, been fitted with electronic monitoring bracelets and released into the United States because they brought children with them, illegally, across the U.S. border. This “catch-and-release” policy is effectively mandated for illegal aliens arriving with children younger than five by Judge Sabraw’s ruling, along with U.S. District Judge Dolly Gee’s refusal Monday to modify 1997’s Flores Settlement. The illegal alien parents of 51 more children are “likely eligible” for the same catch-and-release treatment. Thirty-four have been found to be the actual parents and passed criminal background safety measures and are expected to be placed with children Tuesday, the other 17 are at various stages of completing those checks. 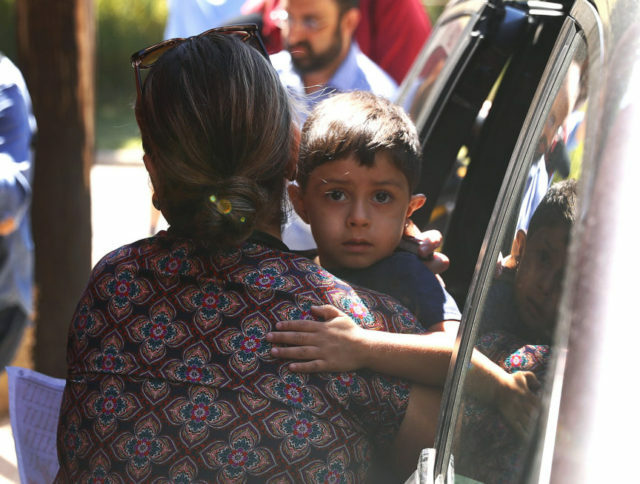 An additional 20 children have purported parents with whom they cannot be reunited because those adults have already been either removed from the United States or released into the country, which removes DHS and HHS’s ability to force them to come get the children they claim are theirs. Update: An earlier version of this article misattributed Chris Meekins’s statements to an ICE official.